If you fail to take care of your teeth properly, you can suddenly be dealing with a host of dental problems. While you probably know about cavities and gum disease, did you know that you could also develop a disease of the pulp? These are serious issues that require root canals or even extraction in order to treat, so it is important that you better understand the diseases that can affect the dental pulp in order to keep your mouth safe. • Irreversible pulpitis. This is a severe type of pulp inflammation that can't be corrected, and symptoms will include sudden and intense pain in the tooth. If left untreated, you'll be left with an infection of the gum and connective tissue. You will likely need a root canal in order to treat this procedure. • Reversible pulpitis. This is a mild form of inflammation, and symptoms can include pain when drinking or eating, especially foods of temperature extremes. This inflammation could result in a collection of pus and bacteria known as a dental abscess, and the condition could occur if you break or crack a tooth. • Dental pulp exposure. This occurs when the external portions of a tooth are damaged so that the pulp is suddenly exposed. A crack or cavity can cause this and may expose your tooth to food particles and bacteria. Without treating this problem, a mild infection will be allowed to turn into a serious abscess and may require an extensive treatment process. • Dental pulp stones. Also known as dental pulp calcification, this condition involves a hardening of the pulp tissue. The end result is extreme pain and hypersensitive nerves. You'll typically need a root canal to clear out the hardened tissue. 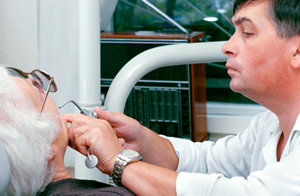 Root canal therapy is typically needed to correct diseases of the dental pulp. Ignoring the problem won't make it go away, as a severe infection can easily spread to the surrounding tissues, including the bone in your jaw. For this reason, the pulp needs to be removed, and a root canal is the easiest way to do this. Root canal procedures are used to remove damaged pulp tissue, and it is the best possible course of action to spare you from needing to have the tooth extracted. During your first dental visit during the root canal procedure, your dentist will create an access hole in the tooth in order to access the inner workings. The diseased pulp will be removed from the pulp cavity, and the root canals will be cleaned out and then enlarged. Your dentist may also need to place medication into the canal to clear out the infection, and you might be put on oral antibiotics. After the tooth has been cleaned appropriately, your dentist can choose to put in a temporary filling or to leave the canal open so that the tooth has a few days to drain. You'll need to come back to have a permanent filling put into place, and a crown will then be placed over the top of the tooth in order to reinforce it and make it stronger. Depending on the specific type of pulp disease that you are experiencing, symptoms can vary. However, sudden and intense pain in the mouth and pain in a tooth when you eat something cold, hot, or very sweet are the most common indications of a problem. If you are concerned about the health of your teeth, contact our office to set up an appointment.